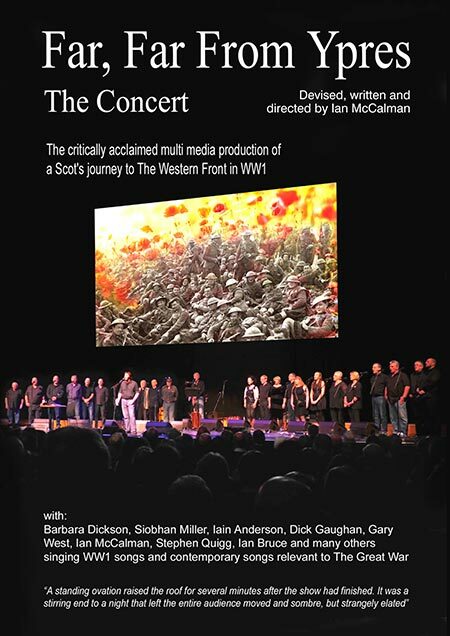 In August, Ian Green went on the Far, Far From Ypres Concert Tour of Oban, Portree and Ullapool, offering the CD Far, Far From Ypres - Songs, Poems and Music of World War I and the newly released DVD Far, Far From Ypres - The Concert. Sales were brisk and mail orders for the DVD have also been excellent. The CD continues to outsell all other Greentrax albums. Ian met many old friends and mail order customers on the tour and their feedback after the concerts was consistent: “A wonderful concert and very emotional…” (as they wiped away a tear or two). Ian has seen the show about six times and watched the DVD twice and still enjoys the amazing spectacle (with a tear or two!). The Usher Hall, Edinburgh, has recently made tickets available for the Upper Circle to accommodate the huge demand for tickets for 11th November. Ian notes that Alan Brydon has recorded a superb album on the subject of World War I, war in general and of the Scottish Borders, called Reflections. Visit Alan Brydon’s website to order this fine album. The Nick Keir Commemorative Concert at the Acoustic Music Centre during the Edinburgh Festival Fringe was a sell-out, and a memorable evening of Nick’s songs, sung by some of his friends and ending appropriately with Nick’s recording of Festival Lights. This song is a Fringe anthem and the words are painted on a wall of The Royal Oak, home of the Wee Folk Club. Sales of Nick’s compilation album 1953 to 2013 - A Double Album Reflecting the Talents of Nick Keir sold well on the night. It includes 37 songs, all written by Nick apart from one, and is the definitive collection of Nick’s work. Carmel and Eric Bogle are currently visiting Scotland but Eric has left his guitar at home, while he enjoys a well deserved holiday with his twin sister Sandra and husband Ron. Eric Bogle With John Munro - Voices is the most recent work by two remarkable songwriters. Sadly John passed away earlier this year and is greatly missed by all, particularly by Eric who toured with John for so many years. The long awaited debut album from Gaelic singer Sineag MacIntyre has been recorded and now has to be mixed and mastered but should hopefully be released on 1st November. Produced by Iain MacDonald and with a host of talented session folk.